We use Dmail for sending out project related emails. For example if we are looking for quotes from suppliers we will use dmail. Any replies will come back into the Project “Quotes” task list. The first and most basic approach is that you can give out your unique Dmail address and have all your emails – or some of them – sent into your Dooster Dmail inbox. This way you can be sure not to forget about your important emails. You can give them due dates and priorities. If they aren’t dealt with you will get reminders and see this in your overview screens. You can keep your new dooster email address to yourself and simply forward your preferred emails to it – for example ones that you want to remind your self about. Then, using the Mail identity feature, duplicate what your normal “from” name looks like and then you can reply to them from your Dooster. The original email sender is non the wiser. Your reply email looks as if it has come from your regular mail client. The third approach is to keep your existing email address – or addresses – and have all your emails forwarded automatically to your dooster inbox. This way you really can handle all your emails from one easy place. Setting up auto forwarding is easy to do. Either you can get your email provider to do it at server level – which should takes them less than a minute – or you can do it your self. It’s just as easy with other email systems like Outlook and Hotmail. This way You can still see all your emails where you used to see them ie in your original email client(s). Nothing has changed, except that now you can give them due dates, priorities and get reminders if you or the person you’re waiting to hear back from forgets to respond. If you reply to an email from dooster and the person responds, it will go straight into your dooster. NOTE: It is best not to email your Team Members using Dmail because Dmails are assigned to projects not to Team Members. You’d be better off assigning Team Members a task. 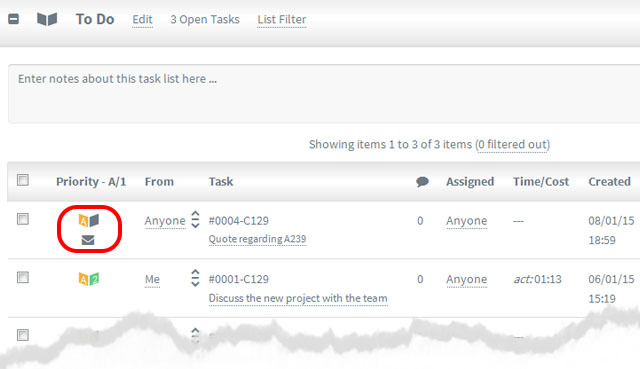 This way the task is added to their “workload” in the system and you can see it when you are filtering by their name.